Acne breakouts leave with them painful reminders of what your skin has gone through— scars. These are formed when a zit deeply penetrates the skin and damages the tissue beneath it. Most serious scars are caused by severe forms of acne or those with painful, pus-filled cysts or nodules. Fortunately, acne scars can be safely treated. It all starts with getting rid of existing acne once and for all as new ones can lead to new scars. 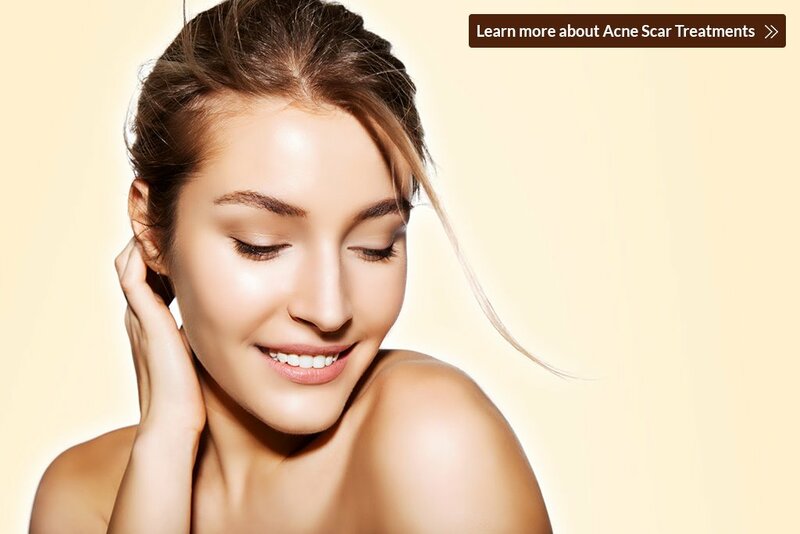 Afterwards, you can proceed exploring these 5 effective acne scar treatments available in aesthetic clinics in Singapore. This medical-grade chemical peel treatment has a special formulation that is designed to improve the tone, texture, and clarity of the skin. It delivers superior results in reducing or eliminating active acne and acne scars, and is safe for patients of all skin types (including those with dark complexion). A VI Peel treatment involves an application of a chemical peel solution that goes into the deep layers of the skin. It is relatively painless, but it may make the skin look tan or reddish for a short amount of time. After the VI Peel solution is applied and have set in your skin, you are free to return to work or go home. However, you may need to wait at least 4 hours before washing off your skin with a mild cleanser. The actual peeling process can begin 1 to 2 days after and can go on for a week. You can use a post-peel cream and a mineral foundation to conceal the skin’s appearance during the peeling process. Avoid doing any strenuous physical activities that will cause excessive perspiration for 72 hours after your peel. Sweating may cause water blisters and may induce post inflammatory hyperpigmentation. Juvedérm Volite, the newest innovation in Juvedérm fillers, is a FDA-cleared injectable treatment designed to improve the quality of your skin for up to nine months. It can also reduce acne scarring and can be used in different parts of the body such as the face, neck, hands, and décolleté area. This filler is made from Hyaluronic Acid (HA), a substance that is also present in our bodies making it safe. Juvederm Volite uses VYCROSS® technology, a unique process that offers a high concentration of crosslinked HA for long-lasting results. It also contains Lidocaine to improve patient comfort during the procedure. Moreover, Juvederm Volite also enhances the results delivered by other dermal fillers in the Juvedérm line. While Juvedérm Volite and other Juvedérm range fillers are safe and FDA-cleared, they should only be administered by an experienced aesthetic doctor. Dr. Sylvia Ramirez of Cutis Laser Clinic is a Harvard-trained doctor and one of the top injector of Juvedérm fillers in Singapore. She was also chosen by Allergan, the makers of Botulinum Toxin (or more commonly known as Botox) and Juvedérm fillers, to conduct clinical trials for the review of the product. This is an advanced automated skin needling device that can improve the appearance of wrinkles and fine lines. It can also promote skin tightening and rejuvenation and reduce surgical and acne scarring, pigmentation and stretch marks. Dermapen Medical uses vertical micro needling technology to penetrate and breakup scar tissues, as well as effectively reach hard-to-reach areas like around eyes, nose, and lips. It then induces immune response, followed by formation of new and healthy collagen. Your skin may appear slightly red and flushed after the procedure, but this usually diminishes a few hours after the treatment. Visible results can be seen after 6 to 8 weeks and will continue to improve over time. It is good to know that Dermapen is an effective drug delivery device, which only means that any product applied during or after the treatment is easily absorbed into the skin. It is also safer and more effective than traditional micro needling rollers. Cutera Pearl Resurfacing is a non-invasive skin treatment for reducing wrinkles, appearance of acne marks, hyperpigmentation, and uneven texture. It treats both the dermis and epidermis layers of the skin to boost collagen production and give skin a healthy, “pearl-like” glow. It works by treating the top layer of skin with pulses of light in a pre-selected pattern. The laser will then send heat to the deeper layers, which triggers the skin to form a natural protective dressing. This will peel off after 3 to 5 days, revealing new and healthier skin. You can notice overall skin clarity, softness, and smoothness after at least one to two weeks. Most are satisfied after just one treatment, but you can opt for another one, depending on the area of your concern. The treatments can only take a few minutes to an hour with little to minimal discomfort. Laser Genesis Skin Therapy is an FDA-approved non-invasive laser treatment used to effectively deal with fine lines, wrinkles, large pores, and uneven skin texture. While this is known as an effective anti-aging treatment, it is also used to treat rosacea, diffuse redness, and reduce acne scars. Studies have shown that Laser Genesis can stimulate the production of new collagen, giving your face a more youthful appearance. It can be combined with LimeLight IPL, which is also a non-invasive light treatment, to address concerns right at skin’s surface, including freckles, mottled complexion, fine lines, and sun damage. If you’re dealing with stubborn acne scars, contact Cutis Laser Medical Clinic and schedule a consultation with our Harvard-trained aesthetic doctor in Singapore, Dr. Sylvia Ramirez.